A SINGAPORE-GROWN international shipping practice, Joseph Tan Jude Benny (JTJB), has licensed the use of its name to help other law firms in port cities develop their shipping and admiralty practice. 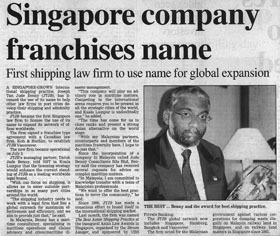 JTJB became the first Singapore law firm to license the use of its name to expand its network of offices worldwide. The firm signed a franchise type agreement with a Canadian law firm, Koh & Buchan, to establish JTJB Vancouver. The new firm became operational on July 3. JTJB’s managing partner, Datuk Jude Benny, told NST in Kuala Lumpur that the licensing strategy would enhance the current standing of JTJB as a leading worldwide legal brand. “With our focus on shipping, it allows us to enter suitable partnerships in as many port cities around the world. “The shipping industry needs to work with a legal firm that has a global outreach for maximum effectiveness and efficiency and we aim to provide just that,” he said. In Malaysia, Benny has a maritime consultancy specialising in maritime operations and claims, advisory and crisis/maritime disaster management. “This company will play an advisory role in maritime matters. Competing in the international arena requires you to be present in all the strategetic cities of the world, and Kuala Lumpur is undoubtedly one,” he added. “The time has come for us to close ranks and present a strong Asian alternative on the world stage. Since the incorporation of a company in Malaysia called Jude Benny Consultants Sdn Bhd, Benny said the company has received several requests for advice on complex maritime matters. “In Malaysia, I am committed to knowledge transfer with a team of Malaysian professionals. “We want to offer the best practices to serve the community,” he said. Since 1996, JTJB has made a conscious effort to brand itself in the international shipping market. Last month, the firm was named The Best Asian Shipping Practice at the inaugural Asian Law Awards in Singapore, organised by the Straits Lawyer and sponsored by UBS Private Banking. The JTJB global network now includes Singapore, Hamburg, Bangkok and Vancouver. The firm acted for the Malaysia government against various corporations for dumping waste illegally on Malaysian railway land in Singapore, and on railway land matters in Singapore since 1995.